Age: The largely dark brown wing coverts and substantial tail-band suggest a 1st cycle gull. Identification: This is a hooded species with obvious eye-crescents. The dark-gray mantle and scapular feathers eliminate paler species such as Bonaparte's, Little and Sabine's Gull. Although not discernable from this single photo, the bill and body size should aid in the elimination process when observed in the field. The only reasonable choices for this 1st cycle gull are Franklin's and Laughing. This month's quiz bird is a rather typical 1st winter Laughing Gull, photographed in Volusia County, Florida. January. For comparison, consider this 1st cycle Franklin's Gull. Illinois. September. First cycle Franklin's show a silvery gray wash across the greater coverts - and perhaps diagnostic - white outer edges to the outermost rectrices. Overall, this species will show whiter underparts and hindeck earlier in the season than Laughing. Finally, Franklin's will often show a much more demarcated semi-hood and wider eye crescents than similar-age Laughing Gulls. Bonaparte's Are Fast - Peregrine's Are Faster! We often see Peregrine Falcons buzzing flocks of gulls and then half-heartedly aborting and changing their intent for reasons unknown to us. Yesterday while wedged between two large boulders on the Manitowoc lakefront, I patiently sat for almost 3 hours admiring a few Little Gulls in a sizable feeding flock of 500+ Bonaparte's Gulls. Suddenly, ALL of the birds took to the air and headed east over the lake in unison. The birds moved with such urgency that I knew the only predator that can elicit such fear is a Peregrine Falcon. Not wanting to be discovered, I remained still and didn't raise my gaze. A few seconds later the falcon zipped right past me, some 75 feet out, and snatched a 1st cycle bird in midair as it tried to gain altitude. I had a fleeting thought it might be a Little Gull, but that wasn't the case. This one-year old Bonaparte's was a couple of seconds too slow. Black-tailed Gull (adult). Kitimat-Stikine County, British Columbia. 04 May 2017. 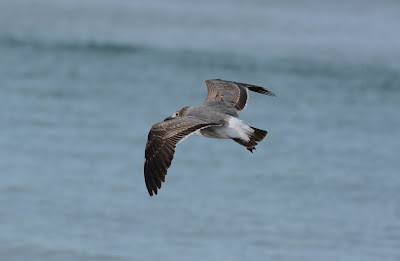 Slaty-backed Gull (3rd cycle). Lambton County, Ontario. 06 May 2017. This individual, presumably seen on the Thunder Bay CBC in January 2017, then in Muskegon, Michigan in April 2017, was resighted just outside of Sarnia, Ontario near the St. Clair River. Black-headed Gul (1st cycle). Erie County, Ohio. 10 May 2017. Slaty-backed Gull (adult). Chippewa County, Michigan. 19 May 2017. Black-tailed Gull (2nd cycle type). San Francisco County, California. 23 May 2017. Ivory Gull (adult). Bonavista/Trinity-Clarenville County, NF & Labrador. 23 May 2017. Age: All 3 birds are in high molt, with a mixture of old and new upperparts. The visible primaries on the rightmost and leftmost birds appear to be 1st generation (note the primaries on the center bird aren't visible). Thus, it's safe to say these large white-headed gulls are roughly 1 year of age. Identification: Both individuals with bi-colored bills look like typical 1st summer Herrings - size and structure rule out smaller species such as Ring-billed, and the thick bills and heavy chests seem to rule out California Gull. The left bird - with a mostly black bill and attenuated look to the rear - is different. The upperparts are genuinely dark with dark centers. Note the bill is relatively long, but straight, ending with a slight droop. The striated neck markings, and dark stippled tips to the new wing coverts, recall Lesser Black-backed Gull, and that's what this month's gull was identified as. 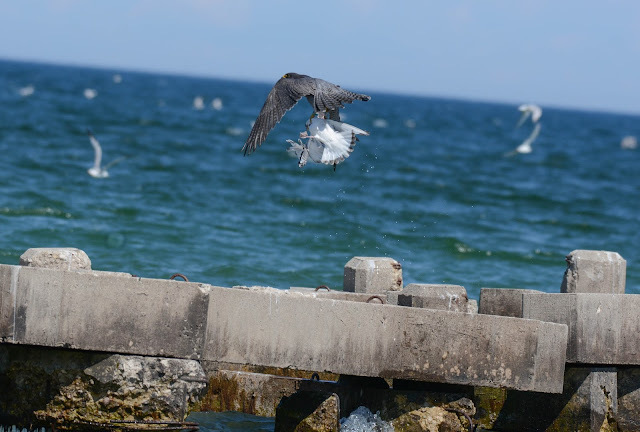 This first summer Lesser was photographed in Sheboygan, Wisconsin. June.